There is no one better than HondaPro Jason, Honda brand enthusiast, to take you on a tour of the 2018 Honda Civic Sedan. The award-winning Civic is a fan favorite year after year because of its outstanding fuel economy, next-level technology, and aggressive styling. Responsive handling is a given, but drivers will also love the available 174-horsepower, turbocharged engine — especially when it returns an EPA-estimated 31 mpg city and 42 mpg highway. 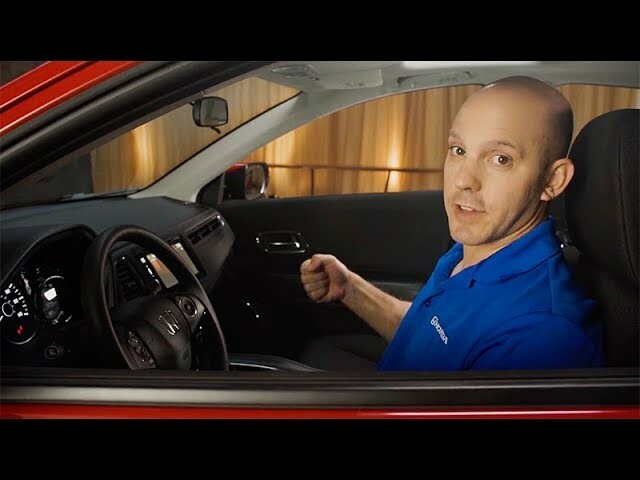 Watch HondaPro Jason as he reviews the exterior and interior features that make the 2018 Honda Civic one of the best compact cars on the road today. Compatible with both Apple CarPlay and Android Auto, it has never been this easy to safely send an email while driving your 2018 Honda Civic. The steering wheel-mounted controls, Display Audio touchscreen, and compatible smartphone work in conjunction with voice recognition technology to send and receive SMS messages. Come along with HondaPro Jason as he reviews the SMS email messaging feature. The 2018 Honda Civic will keep you safely connected to your smartphone with Android Auto. For easy integration, simply plug your compatible Android device into the Display Audio touchscreen and within moments you will be accessing your phone's apps, music, and maps. 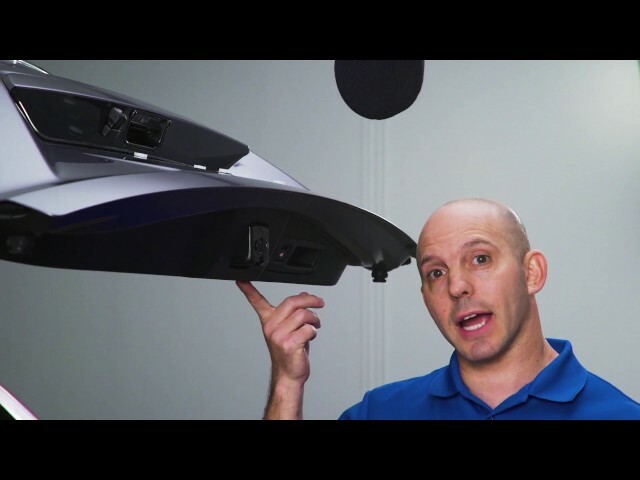 Watch HondaPro Jason as he reviews the Android Auto feature for the 2018 Honda Civic Sedan. Apple CarPlay integration is the perfect feature to access your apps, music, and maps, while also help prevent against distracted driving. Simply plug your compatible iPhone into the Display Audio touchscreen of your 2018 Honda Civic to always stay connected. 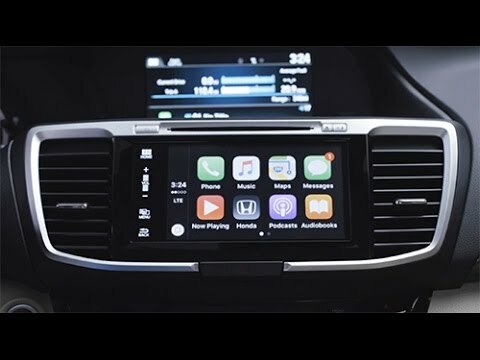 Join HondaPro Jason as he reviews the Apple CarPlay feature for the 2018 Honda Civic Sedan. Entering the 2018 Honda Civic Sedan is as simple as grabbing the handle and opening the door. However, with a front seat passenger, you will need to program the door locks using your Display Audio touchscreen and the Keyless Access Setup menu. 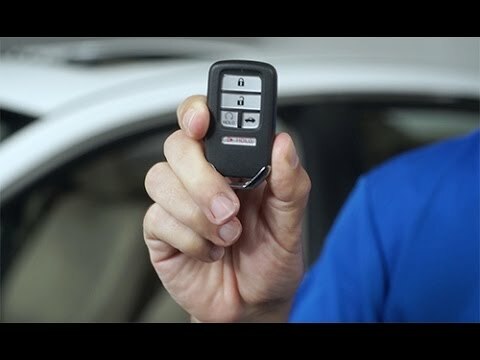 Come along with HondaPro Jason as he reviews the programmable door locks feature via the Keyless Access System. In a compact car you have to maximize storage, and the 2018 Honda Civic does just that. The innovative center console has enough space for a one-liter water bottle and tablet, a designated area for your key fob, a USB port, and removable spill mat. Take a look inside the 2018 Honda Civic Sedan with HondaPro Jason as he reviews the features and functionality of the center console. The legendary Honda Accord is back for the 2018 model year and so is HondaPro Jason to take you on a tour of this award-winning vehicle. This 2018 Accord walk-around video touches on everything from style and performance to features and interior space. 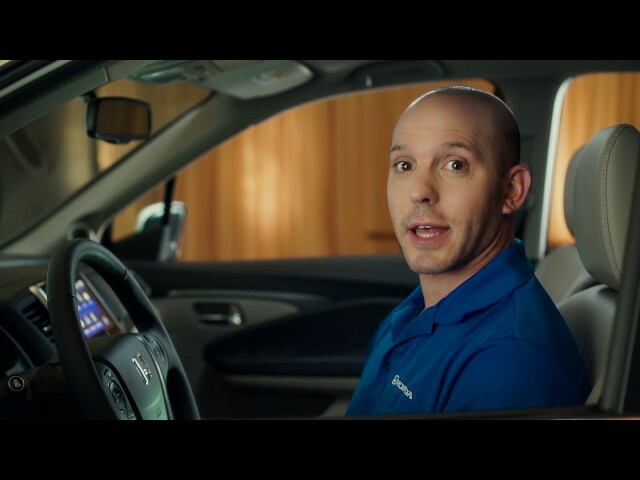 Join HondaPro Jason for a review of exciting technology like Apple CarPlay and Android Auto, wireless device charging, 4G LTE mobile hotspot, Head-Up Display, and Honda Sensing — a suite of driver assistive features such as Collision Mitigation Braking System, Road Departure Mitigation System, Adaptive Cruise Control, Lane Keeping Assist System, and Traffic Sign Recognition. The Display Audio touchscreen of your 2018 Honda Accord is home to many different icons and shortcuts, but sometimes you may wish to declutter your main screen. Luckily, your Display Audio touchscreen is fully customizable with the same drag and drop functionality as many smartphones. Come along with HondaPro Jason as he reviews the customizable features of the Display Audio touchscreen. For added peace of mind after parking your 2018 Honda Accord, the Electronic Parking Brake can be set up to automatically activate once the vehicle has been turned off. Take a look inside the 2018 Honda Accord with HondaPro Jason as he reviews the Electric Parking Brake feature. With most functions for the 2018 Honda Accord being electric, how can you manually open the trunk in the event of a dead battery? The Emergency Trunk Access feature is as simple as removing the key from the key fob and using said key to manually release the trunk from the backseat. 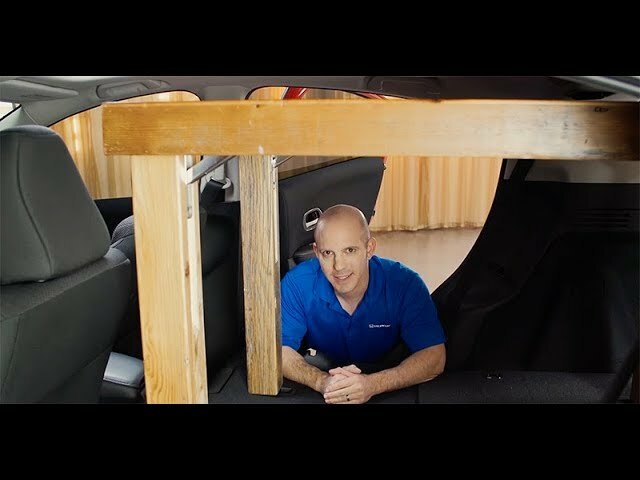 Follow HondaPro Jason as he reviews the Emergency Trunk Access feature for the 2018 Honda Accord Sedan. If someone else is driving your 2018 Honda Accord, you may not want to allow them full access to the vehicle. With Valet Mode, simply turn off the main switch located inside the glove compartment to lock the key fob, trunk release, and inside door. 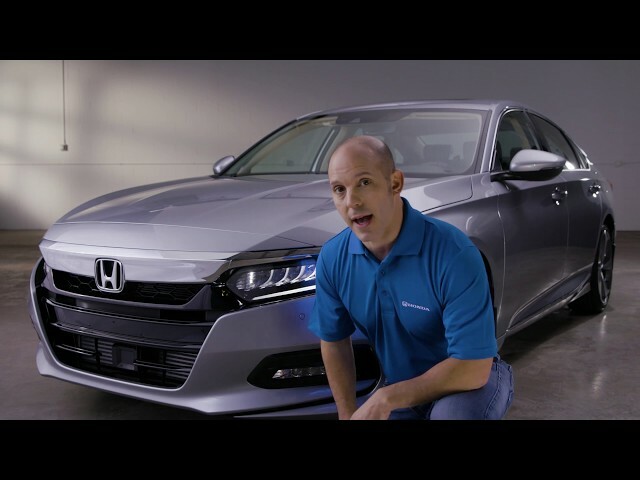 Join HondaPro Jason as he reviews the Valet Lock feature for the 2018 Honda Accord Sedan. The key fob on your 2018 Honda Accord provides more than just keyless entry in to your vehicle. In addition to activating your remote engine start, the key fob can automatically open all of the windows and power moonroof to help cool off the interior on those hot summer days. 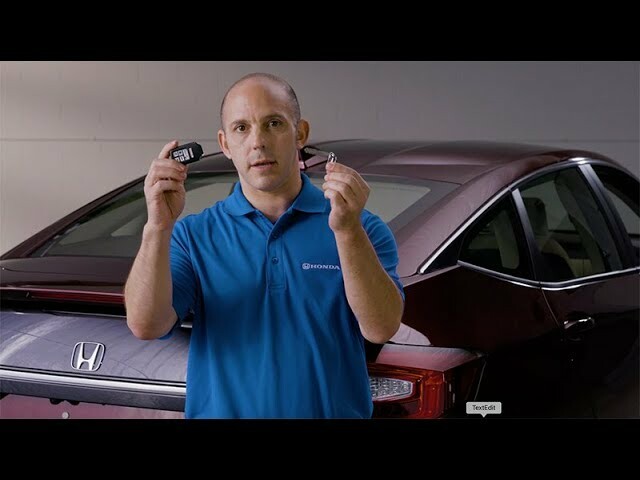 Watch HondaPro Jason as he reviews key fob features and functionality for the 2018 Honda Accord Sedan. Come along with HondaPro Jason as he takes you on a tour of Motor Trend's 2018 SUV of the Year: the 2018 Honda CR-V. This walk-around video for the all-new CR-V highlights everything from performance to tech features, showing you exactly why CR-V is the crossover SUV chosen by automotive experts and families alike. While many drivers will be impressed by the 2018 CR-V and its available, turbocharged 190-horsepower engine, others will appreciate the overly spacious interior that comes loaded with power outlets, USB ports, and useful features like a 7-inch Display Audio touchscreen, Apple CarPlay and Android Auto, dual-zone climate control, and a center console large enough to house a laptop. Always at the forefront of innovative safety, Honda has equipped the 2018 CR-V with an Alertness Monitor feature which provides visual, audible, and physical alerts to the driver if the system recognizes that your vehicle has been drifting side to side. Follow HondaPro Jason as he reviews the Driver's Attention Monitoring System feature for the 2018 Honda CR-V crossover SUV. Everyone knows that Apple CarPlay is an awesome feature that allows you to integrate your iPhone with the Display Audio touchscreen on your 2018 Honda CR-V. But did you know you can also customize your shortcuts from the settings menu on your iPhone? Watch HondaPro Jason as he reviews the Apple CarPlay feature for the 2018 Honda CR-V crossover SUV. The 2018 Honda CR-V is customizable in so many different ways, and this includes its Display Audio touchscreen interface. If you wish to add/remove or change the sequence of your shortcuts on the home screen, simply drag and drop the icons just as you would on a smartphone. 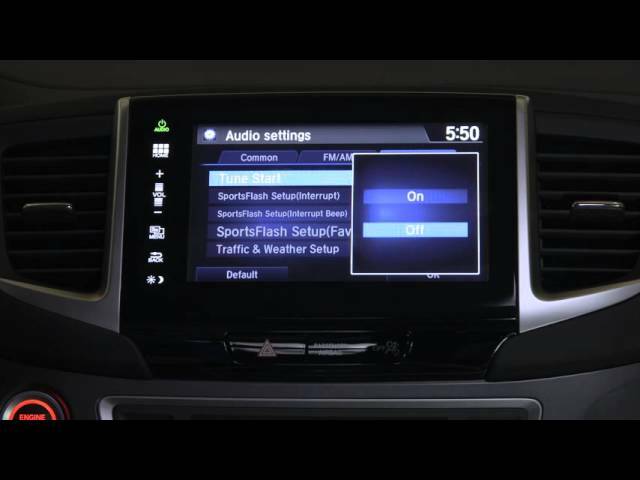 Take a look inside this crossover SUV with HondaPro Jason as he reviews how to customize the home screen of your Display Audio touchscreen. Whether you're carrying a few two-by-fours, shopping bags, or a small child, the 2018 Honda CR-V has you covered with its hands-free liftgate. Simply kick your foot underneath the bumper and the tailgate will automatically open. Follow HondaPro Jason as he reviews the hands-free feature for the power tailgate on the 2018 Honda CR-V crossover SUV. The power tailgate on the 2018 Honda CR-V can easily be opened, stopped, and closed with your key fob. What you might not know is you can adjust how high the power tailgate opens in a few simple steps — a truly customizable crossover SUV. 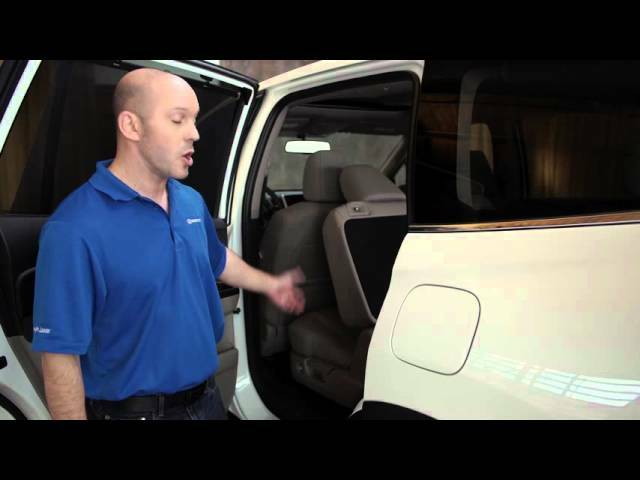 Come along with HondaPro Jason as he reviews the adjustable height feature of the power liftgate. Honda doesn't take safety lightly, even when it comes to their headlights. The 2018 Honda CR-V has high beams that automatically turn on if there is no oncoming traffic. If you prefer to manually operate your high beam headlights, this feature can be deactivated in a matter of seconds. 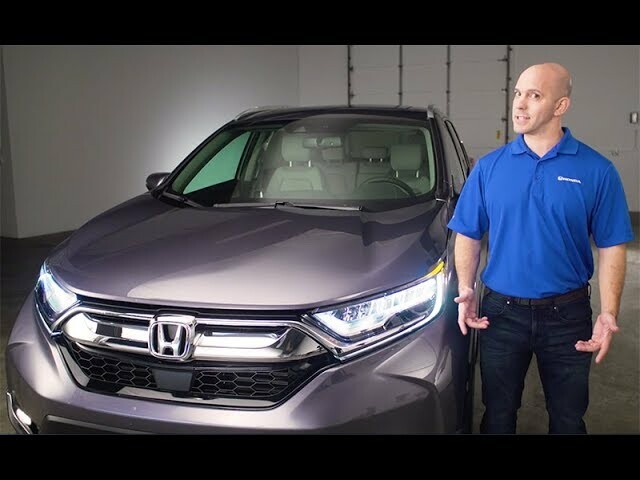 Join HondaPro Jason as he reviews the Auto On High Beams for the 2018 Honda CR-V crossover SUV. 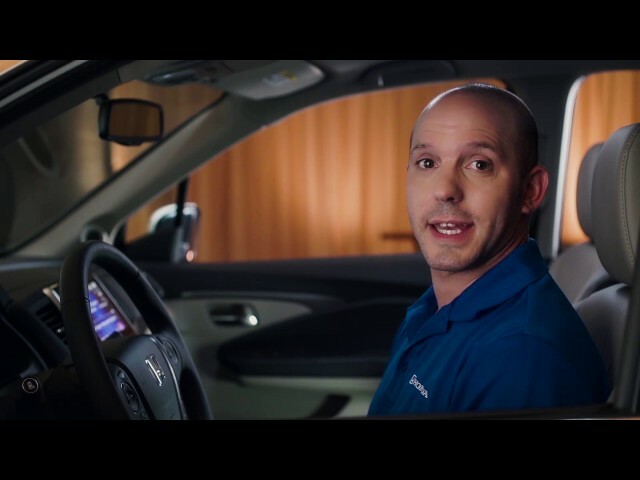 Honda is changing the way drivers look at hybrid vehicles with the introduction of its 2018 Clarity Plug-In Hybrid and HondaPro Jason is the perfect tour guide to show you around this revolutionary sedan. The electric motor will take you 47 miles on one charge, ideal for most daily commutes. However, when paired with the 181-horsepower, 1.5-liter gasoline engine, the 2018 Honda Clarity Plug-In Hybrid has an EPA-estimated driving range of 340 miles! The spacious interior is home to an 8-inch Display Audio touchscreen, Apple CarPlay and Android Auto, dual-zone climate control, and Honda Sensing, the comprehensive suite of driver assistive technologies such as Adaptive Cruise Control, Collision Mitigation Braking, Lane Keeping Assist, and Road Departure Mitigation. Just like any Honda vehicle, the Clarity Plug-In Hybrid is a technological marvel. Within the Dynamic Driving Modes of the 2018 Honda Clarity Plug-In Hybrid is HV Mode, which can maximize efficiency in various ways. One push of the HV Mode button can either hold the state of charge or use the gasoline-powered engine to actually help charge the battery itself. Follow HondaPro Jason as he reviews the HV Mode feature for the 2018 Honda Clarity Plug-In Hybrid. In the event of a dead battery, how will you access the trunk of your 2018 Honda Clarity Plug-In Hybrid? Since almost every feature uses electric power, your key fob and the button on the exterior of the trunk won't work. Luckily, the Emergency Trunk Access feature will manually open the trunk in a matter of seconds. Come along with HondaPro Jason as he reviews the Emergency Trunk Access feature for the 2018 Honda Clarity Plug-In Hybrid. With so many different features to monitor, it only makes sense that the instrument cluster inside the 2018 Honda Clarity Plug-In Hybrid would be fully customizable. Simply access the system settings menu via the Display Audio touchscreen to add/remove items or change the sequence in which they appear. 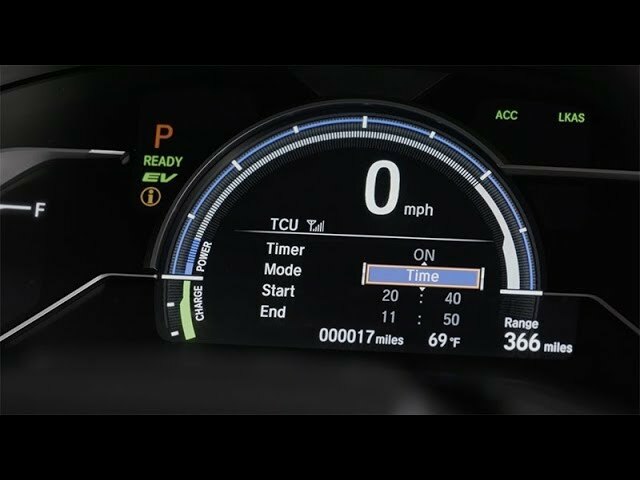 Take a look inside the 2018 Honda Clarity Plug-In Hybrid with HondaPro Jason as he reviews how to configure the instrument cluster. The 2018 Honda Clarity Plug-In Hybrid is unbelievably efficient, but it doesn't prioritize fuel economy ahead of safety. Passengers will be safe and snug thanks to the seat belt ratchet feature which quickly (and easily) eliminates any slack in the safety belts. Join HondaPro Jason as he reviews the seat belt ratchet feature for the 2018 Honda Clarity Plug-In Hybrid. Charging your 2018 Honda Clarity Plug-In Hybrid is easy, but programming the charge timer is even easier. Simply use the steering wheel-mounted controls, digital instrument cluster, and charge timer setup menu to make adjustments. 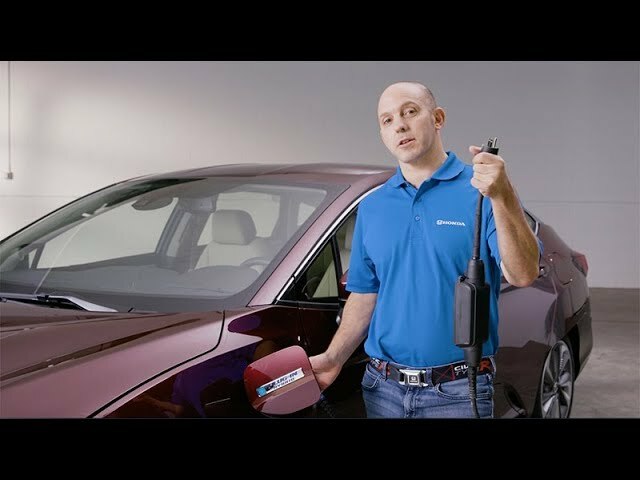 Watch HondaPro Jason as he reviews the charging timer setup feature for the 2018 Honda Clarity Plug-In Hybrid. How did HR-V earn a 2018 5-Year Cost to Own Award from Kelley Blue Book's KBB.com? 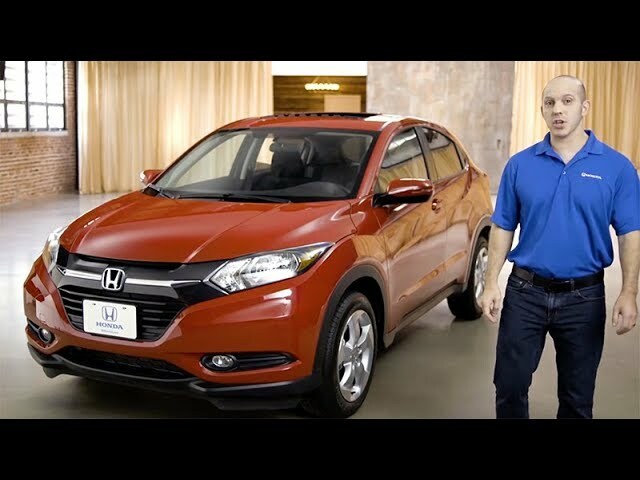 Join Honda brand specialist HondaPro Jason as he takes you on a tour of the 2018 Honda HR-V. The 2018 HR-V may be a smaller SUV, but Honda manages to fit plenty of style, technology, and cargo space into this subcompact crossover. Perhaps the most attractive aspect of the HR-V is its available all-wheel drive (AWD) option that still achieves an impressive, EPA-estimated 27 mpg city and 32 mpg highway. 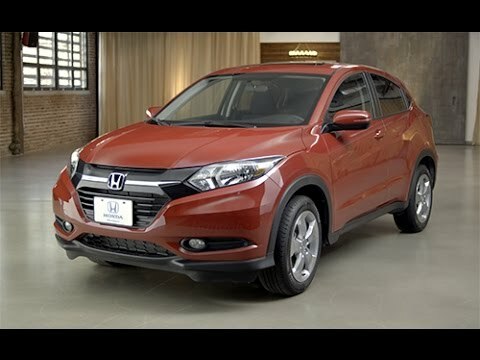 Watch this video now to review features, performance specs, and exterior design elements for the all-new Honda HR-V.
Often times, the safety belts in other vehicles aren't so safe because they allow too much slack between the belt and passenger. This is not the case inside the 2018 Honda HR-V, which features automatic tension seat belts to keep riders securely in place. 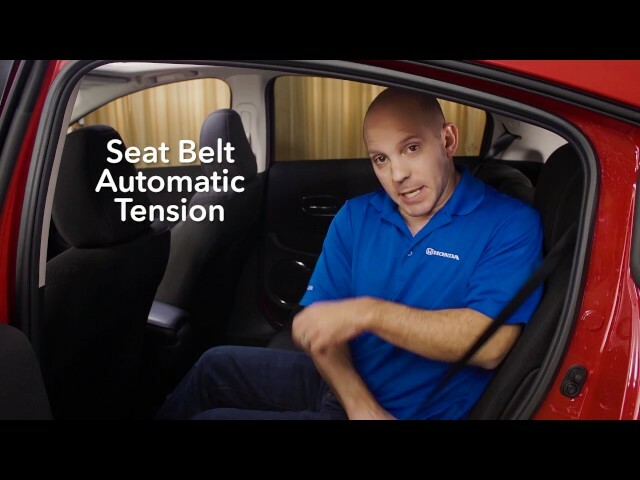 Watch HondaPro Jason as he reviews the automatic tension seat belts for the 2018 Honda HR-V subcompact SUV. Continuously stomping on the brake pedal is just one less thing you need to worry about on board the 2018 Honda HR-V. The automatic brake hold is perfect during stop and go traffic or waiting for long trains to pass by. 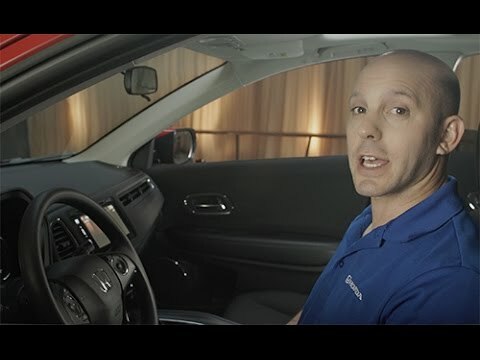 Watch HondaPro Jason as he reviews the automatic brake hold feature for the 2018 Honda HR-V subcompact SUV. Intelligent engineering has once again made its presence felt inside the 2018 Honda HR-V with an electric parking brake. Instead of the traditional lever in the center console or driver's side floor, HR-V features a small button that activates and deactivates the parking brake with the touch of a finger. Follow HondaPro Jason as he reviews the electronic parking brake feature for the 2018 Honda HR-V subcompact SUV. 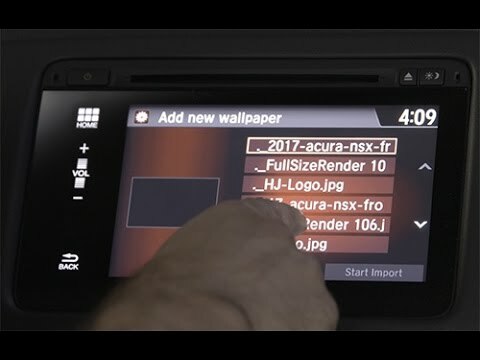 Akin to changing the wallpaper on your desktop computer, the 2018 Honda HR-V allows you to customize the home screen of your Display Audio touchscreen. Simply load your photos to a flash drive, connect the flash drive to the USB port, and locate the desired photo via the Display Audio system settings. Come along with HondaPro Jason as he reviews the customizable home screen of the Display Audio interface. The infotainment interface for the 2018 Honda HR-V borrows functionality from today's smartphones, swiping, clicking and dragging with just your fingertips. The full-color, high-resolution Display Audio touchscreen does it all without any knobs or buttons. Join HondaPro Jason as he reviews the Display Audio touchscreen feature for the 2018 Honda HR-V subcompact SUV. The 2018 Honda HR-V may be considered a subcompact SUV but its maximum cargo area says otherwise. Thanks to the 60/40 split 2nd-row Magic Seat, HR-V features three different interior configurations, including Long Mode, Tall Mode, and Utility Mode. Take a look inside the 2018 Honda HR-V with HondaPro Jason as he reviews the Magic Seat feature. 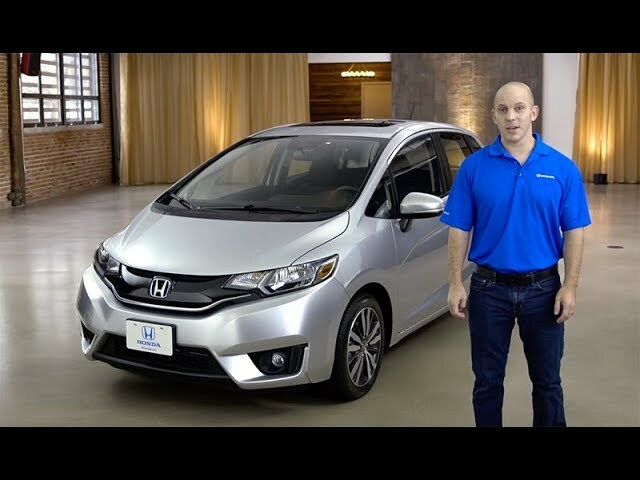 Named the 2018 U.S. News Best Subcompact Car for the Money, the 2018 Honda Fit is functional fun and Honda's brand ambassador HondaPro Jason is here to show you why with an informative video tour. Take a quick walk-around the 2018 Honda Fit to review exterior design elements like folding side mirrors, interior features like the 60/40 split Magic Seat, and useful technology like Bluetooth connectivity. Remarkable fuel economy and versatile interior configurations round out the 2018 Fit, making it a can't-miss in the subcompact car segment. What's so special about cupholders? Nothing, unless you're driving the 2018 Honda Fit. With your climate control in mind, Honda has put a cup holder to the left of your steering wheel (just in front of the vent) for cooler drinks on hot summer days and warmer drinks during the winter. Take a look inside the 2018 Honda Fit with HondaPro Jason as he reviews the cup holders. Pinch Protection is an intuitive safety feature on the 2018 Honda Fit that automatically stops the windows or power moonroof from closing if an obstruction is detected. Follow HondaPro Jason as he reviews the Pinch Protection feature for the 2018 Honda Fit. The 2018 Honda Fit is one of the most spacious subcompact cars in its segment thanks to Honda's Magic Seat. This 60/40 split folding rear seat allows for four different interior configurations, including Utility Mode, Long Mode, Tall Mode, and Refresh Mode. Come along with HondaPro Jason as he reviews the Magic Seat feature for the 2018 Honda Fit. In a time when distracted driving is more common, the SMS text message function for the 2018 Honda Fit allows you to safely check messages from your compatible smartphone without taking your hands of the steering wheel. Follow HondaPro Jason as he reviews the SMS text message feature for the 2018 Honda Fit. HondaLink Assist is a safety app that works in conjunction with your compatible smartphone, Bluetooth, and the Display Audio touchscreen of your 2018 Honda Fit. In the event that a crash is detected, HondaLink will contact emergency services. Join HondaPro Jason as he reviews the HondaLink Assist feature for the 2018 Honda Fit. 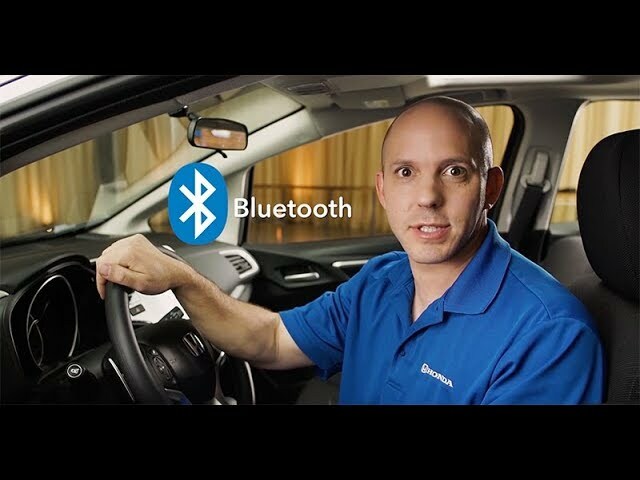 Even if you don't have Apple CarPlay or Android Auto, you can still listen to music from your compatible smartphone thanks to Bluetooth connectivity. Simply pair your phone with the Display Audio touchscreen of your 2018 Honda Fit, and within seconds you will have access to your music library. 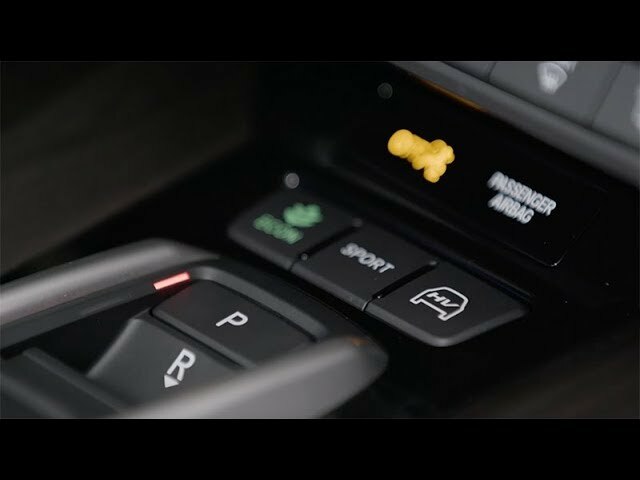 Take a look inside the 2018 Honda Fit with HondaPro Jason as he reviews the Bluetooth connectivity feature. The 2018 Honda Fit comes with an extra set of eyes in the form of a rearview camera. For added safety, the rearview camera with dynamic guidelines is extremely helpful for backing up and reversing in to a parking spot. 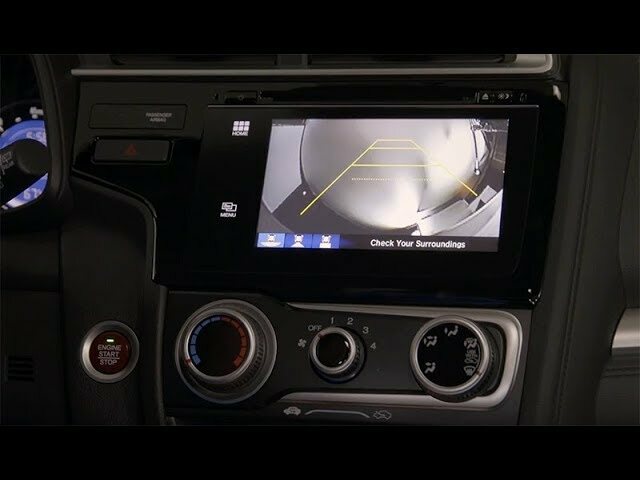 Watch HondaPro Jason as he reviews the backup camera feature for the 2018 Honda Fit. 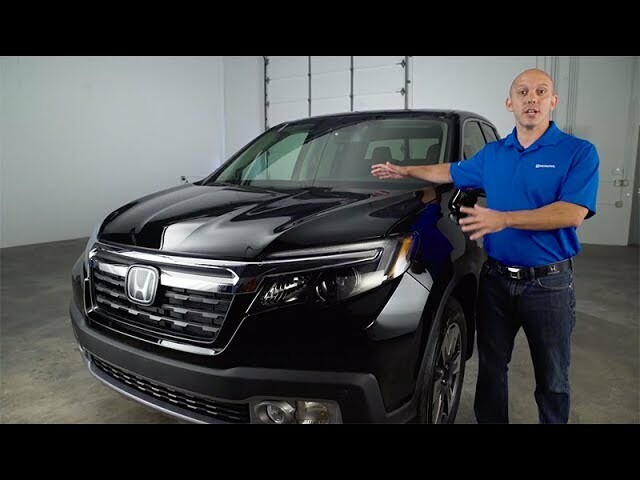 Watch HondaPro Jason as he demonstrates how the 2018 Honda Ridgeline earned both the Car and Driver Best Midsize Pickup and North American Truck of the Year awards. Sure, the 2018 Ridgeline can be equipped with awesome features such as Apple CarPlay, Android Auto, and tri-zone automatic climate control, but it's industry firsts like an In-Bed Trunk and Truck Bed Audio System that set Ridgeline apart from the competition. When it's time to work, the 2018 Honda Ridgeline is ready to go with a 280-horsepower V6 engine, available all-wheel drive, over 1,500-pound payload and towing capacity of up to 5,000 pounds (AWD). 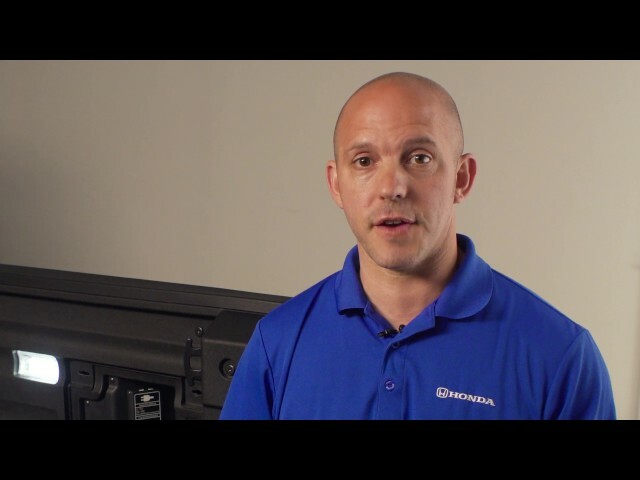 Watch HondaPro Jason review the new Ridgeline now! In the event of a dead battery or loss of power, how will you open the fuel door of your 2018 Ridgeline? Luckily, Honda has hidden a manual override in the backseat of the truck. With a little help from the key inside the key fob, you will have access to the fuel tank in a matter of seconds. 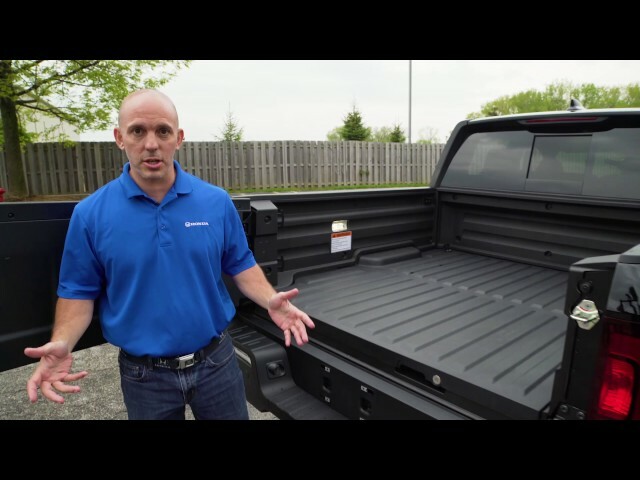 Watch HondaPro Jason as he reviews the manual fuel door release feature for the 2018 Honda Ridgeline pickup truck. The 2018 Honda Ridgeline and its Truck Bed Audio System bring the party to any activity. With six speakers (or exciters) built in to the bed of the truck and Bluetooth connectivity, listening to music while camping, tailgating, or working has never been this easy. 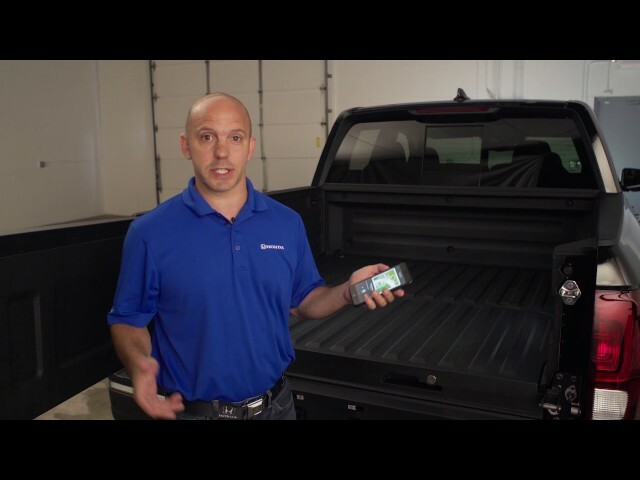 Join HondaPro Jason as he reviews the Truck Bed Audio System feature for the 2018 Honda Ridgeline pickup truck. If the truck bed of your 2018 Honda Ridgeline is full, but you need a little more cargo area, the 60/40 lift-up rear seats will create enough storage space for objects both long and tall. Take a look inside the 2018 Honda Ridgeline with HondaPro Jason as he reviews the lift-up rear seating. The 2018 Honda Ridgeline is one of the most innovative and versatile pickups in the midsize truck segment, and its In-Bed Trunk is all the proof you need. Sure, it can be used for storage, but the In-Bed Trunk can also be used as an ice chest during camping trips, tailgating, or any other activity that requires a cold beverage. When the party's over, simply remove the cooler drain plug to empty any excess water. 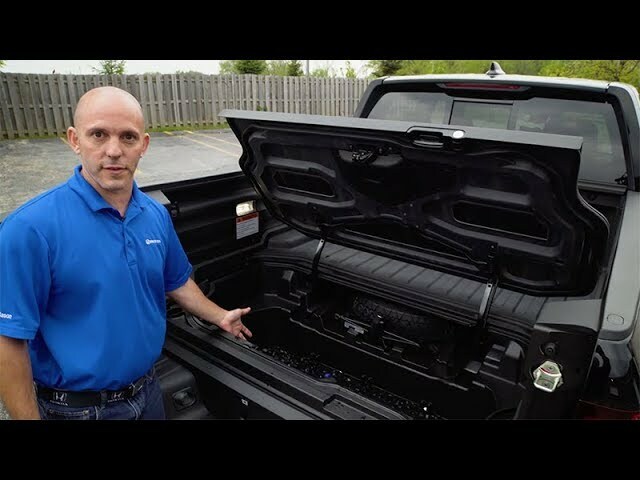 Come along with HondaPro Jason as he reviews the cooler drain feature found within the In-Bed Trunk of the 2018 Honda Ridgeline pickup truck. If you are going to be using your 2018 Honda Ridgeline for work, this feature is for you! The Ridgeline has a charging system built in to the sidewall of its truck bed for up to 400 watts of power when the truck is parked and 150 watts while driving. 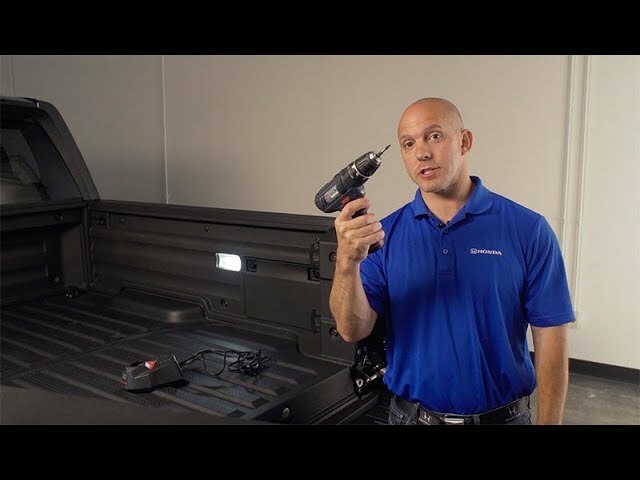 Follow HondaPro Jason as he reviews power tool charging in the 2018 Honda Ridgeline pickup truck. Follow Honda brand ambassador, HondaPro Jason, as he takes you on a tour of the 2018 Pilot. Honda's three-row SUV is the ultimate family vehicle with loads of interior space to carry both passengers and cargo. Like any Honda vehicle, the 2018 Pilot comes loaded with features ranging from safety (rearview camera) to comfort (tri-zone climate control). However, families are going to enjoy the added peace of mind provided by the 3.5-liter, 280-horsepower engine and available all-wheel drive (AWD). 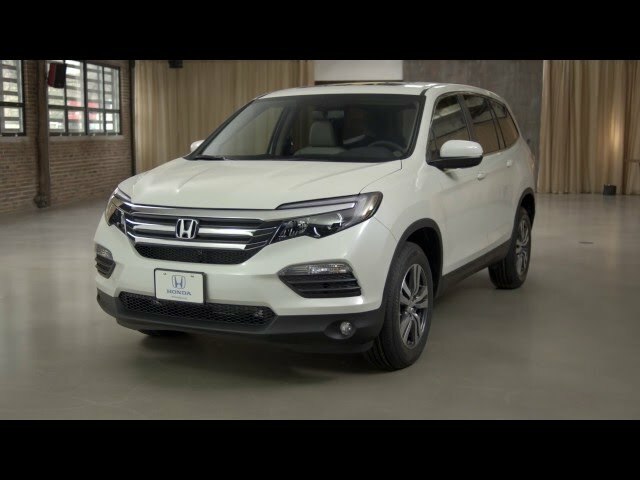 Watch HondaPro Jason's review of the 2018 Honda Pilot now! SiriusXM Radio wants to make sure you hear your favorite songs in their entirety. Using Tune Start, found within the audio settings of your Display Audio touchscreen, this feature is designed to play the current song of a selected station preset from the very beginning. 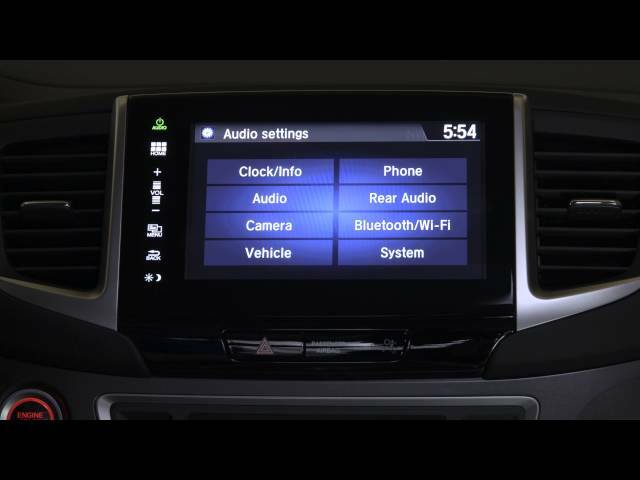 Take a look inside the 2018 Honda Pilot with HondaPro Jason as he reviews SiriusXM Radio with the Tune Start feature. Never miss another scoring update from your favorite team while driving your 2018 Honda Pilot. Thanks to SportsFlash and the Display Audio touchscreen, you will never have to fumble with your smartphone or surf the dial for a specific score ever again. Simply enter your favorite leagues and teams into the settings, and SportsFlash will interrupt your radio whenever there has been a change in score. Come along with HondaPro Jason as he reviews the SportsFlash feature found on the Display Audio touchscreen. In this day and age of smartphones and tablets, USB ports are a necessity. Lucky for you, the 2018 Honda Pilot comes equipped with three USB ports, two of which are 2.5 amp. Keep your devices charged and stay connected with the 2018 Pilot. Join HondaPro Jason as he reviews the USB ports for the 2018 Honda Pilot SUV. Everyone knows the 2018 Honda Pilot features ample cargo space behind the third row of seating. What you might not know is the hatch mat is reversible with a hard, plastic side that is perfect for wet or dirty items. Watch HondaPro Jason as he reviews the reversible hatch mat feature for the 2018 Honda Pilot SUV. The 2018 Honda Pilot is the ultimate three-row SUV and now they've made it even easier to access the third row. Entering and exiting the Pilot is as simple as pushing a button, conveniently located at the base of the second row to get in and at the top of the second row to get out. Follow HondaPro Jason as he reviews the push-button feature for access to the Pilot's third row of seating. 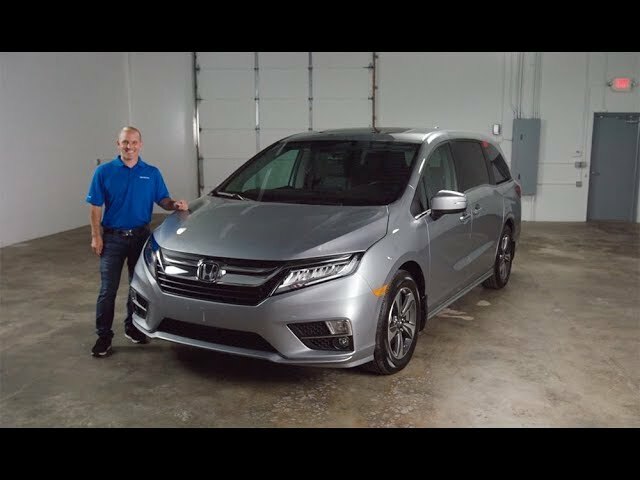 Join HondaPro Jason as he takes you on a fun, informative tour of the all-new 2018 Honda Odyssey. The Honda brand ambassador not only takes you on a walk around of the redesigned minivan, but he also reviews the exciting new features found on board the 2018 Odyssey. 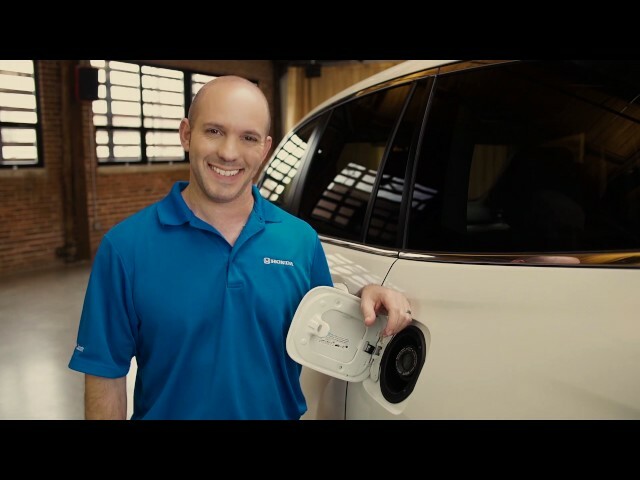 Take a tour with HondaPro Jason and watch him explore convenient features like the hands-free power liftgate, HondaVAC built-in vacuum, mobile Wi-Fi hotspot, CabinWatch, CabinTalk, 2nd-Row Magic Seats, and much more! Watch this Tips & Tricks video all about the 2018 Honda Odyssey's Walk Away Auto Lock feature. It's as easy as opening your vehicle settings on the display screen, selecting the Keyless Access menu, and enabling Walk Away Auto Lock. Follow Honda brand evangelist HondaPro Jason as he shows you how it works. 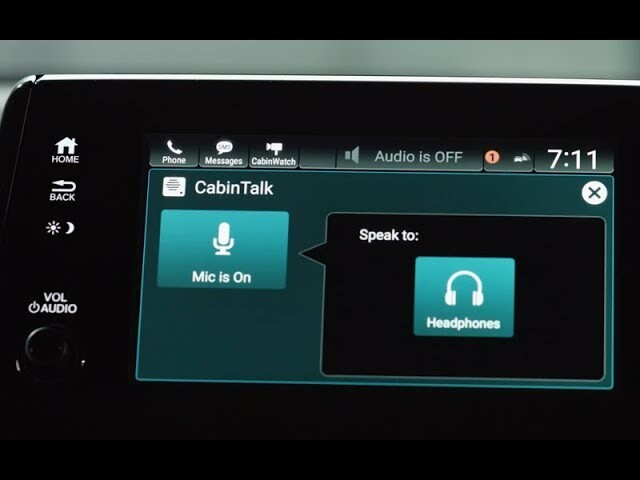 Watch this Tips & Tricks video all about the 2018 Honda Odyssey's CabinTalk feature. Speak to second and third row passengers without raising your voice thanks to this in-car PA system that will even interrupt music or entertainment being played through the passengers' headphones. 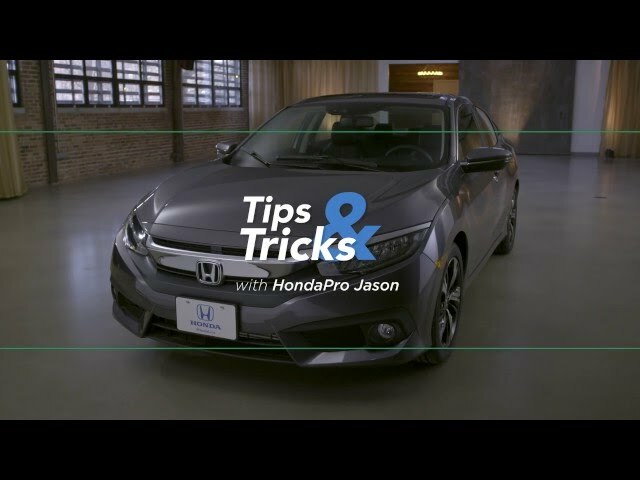 Join Honda brand guru HondaPro Jason as he explains this great new feature. Watch this Tips & Tricks video all about the 2018 Honda Odyssey's all about the all-new CabinWatch feature. Thanks to a camera in the ceiling of the rear seat, Odyssey drivers can monitor backseat passengers on their display screen. CabinWatch is also equipped with night vision and zooming in/out capability. 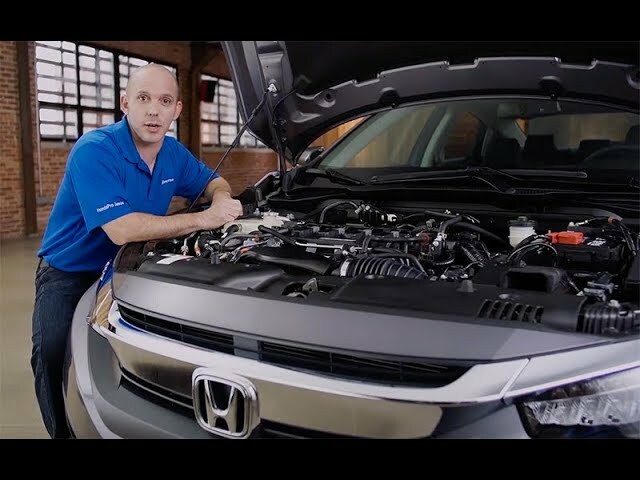 Tag along with HondaPro Jason, the Honda brand ambassador, as he demonstrates this great new feature. Watch this Tips & Tricks video all about the 2018 Honda Odyssey's auto windows. With a couple button taps on your key fob you can automatically open all of the windows and the power moonroof to cool down the inside of your Odyssey on those hot summer days. Join Honda brand evangelist HondaPro Jason as he shows just how easy it is. Watch this Tips & Tricks video all about the 2018 Honda Odyssey's power liftgate with adjustable height setting. Whether you need more clearance while loading tall items or you're liftgate is opening up too high for you to reach comfortably, adjust the height with the touch of a button. Follow Honda brand guru HondaPro Jason as he demonstrates. 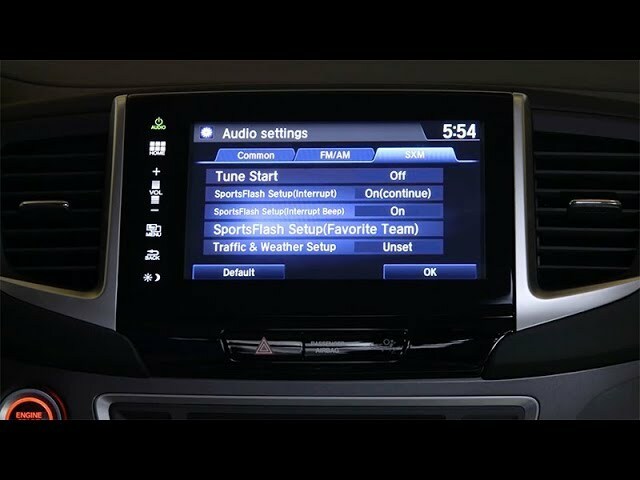 Watch this Tips & Tricks video all about the 2018 Honda Odyssey's HondaLink app. Remotely start the Odyssey, check the interior temperature, monitor tire psi, and even locate your Odyssey if you forgot where you parked—all from your smartphone! Follow Honda brand ambassador HondaPro Jason as he runs through these useful functions. 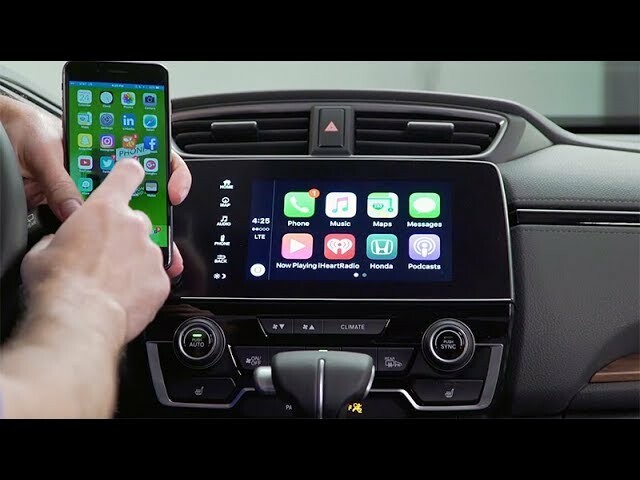 Join HondaPro Jason inside of the 2017 Honda Accord as he shows you the key features of Apple CarPlay within your car. Come alongside the 2017 Honda Accord with HondaPro Jason as he walks you through the new features within the smart key. 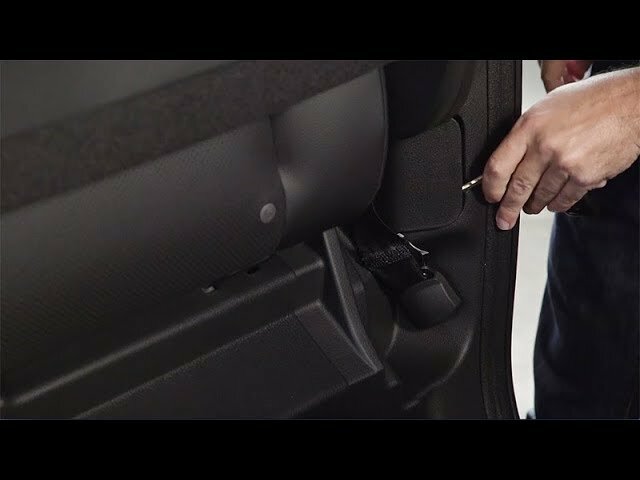 Join HondaPro Jason behind the 2017 Honda Accord as he shows you the new key features within the trunk of your car. 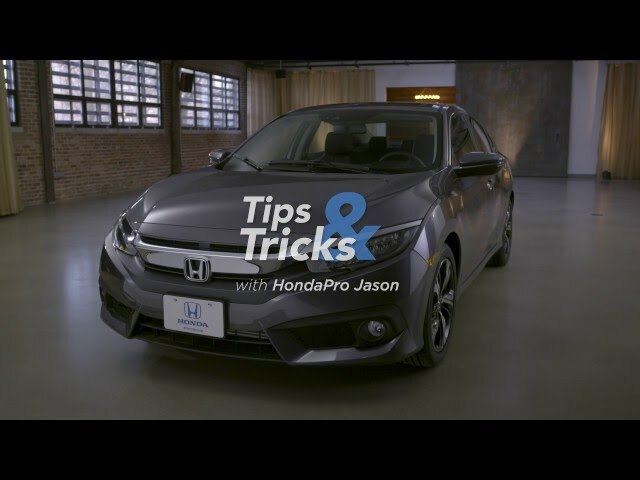 The 2017 Honda Civic is now available and HondaPro Jason is here to show you all of it’s awesome features. Join him as takes you through the new chrome front grille, the one touch fuel door, the foldable seats and much more. Check out the links below for helpful tips and tricks from HondaPro Jason. 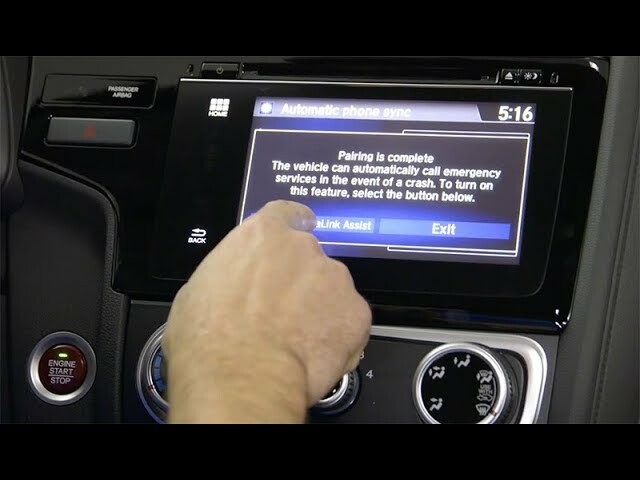 Step inside of the 2017 Honda Civic as HondaPro Jason shows you how to send an email, hands free! 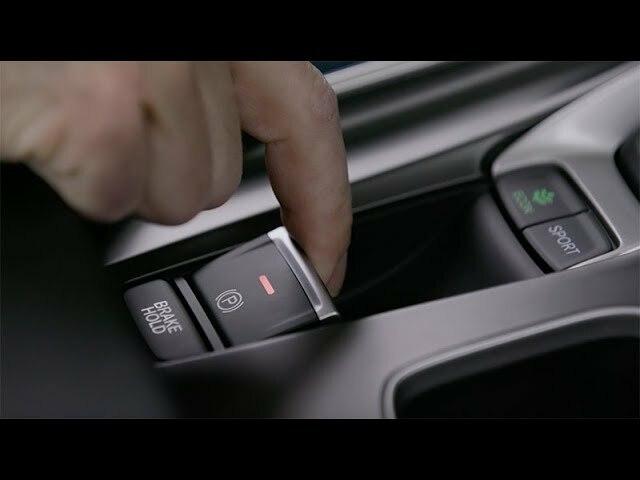 Come alongside of the 2017 Honda Civic as HondaPro Jason shows off the new programmable locks function. Come inside of the 2017 Honda Civic as HondaPro Jason shows you the key features of the new LaneWatch camera. 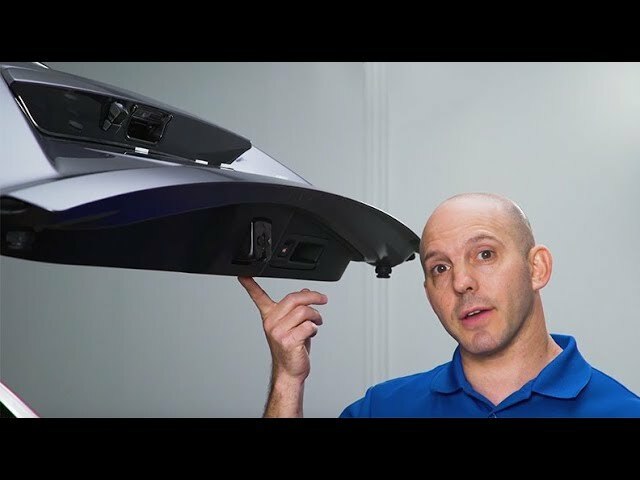 Join HondaPro Jason inside of the 2017 Honda Civic as he shows off all of the new features of the center console. Step inside of the 2017 Honda Civic as HondaPro Jason shows you how to setup Apple CarPlay within your car. 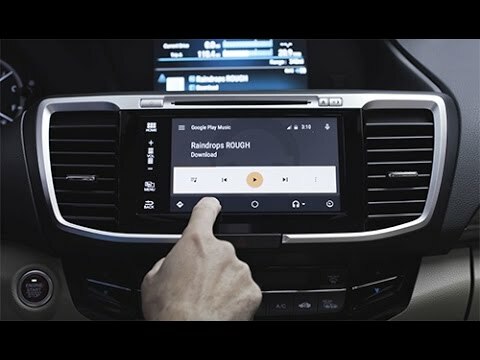 Join HondaPro Jason inside of the 2017 Honda Civic as he shows you how to setup Android Auto within your car. HondaPro Jason is here to show off the brand new 2017 Honda Pilot. Join him as he takes you through his ground up tour of the new model. HondaPro Jason will be showing you everything from the new chrome front grille, to the new power liftgate with camera, all the way inside to his favorite interior features. Check out the links below for helpful tips and tricks from HondaPro Jason. Come inside of the 2017 Honda Pilot as HondaPro Jason shows you how to listen to the beginning of all of your favorite XM Radio songs. Join HondaPro Jason inside of the 2017 Honda Pilot as he shows off the three USB Ports included, two of which with enough power to charge a tablet! Join HondaPro Jason as he takes you through the newly designed capless fuel tank on the 2017 Honda Pilot. 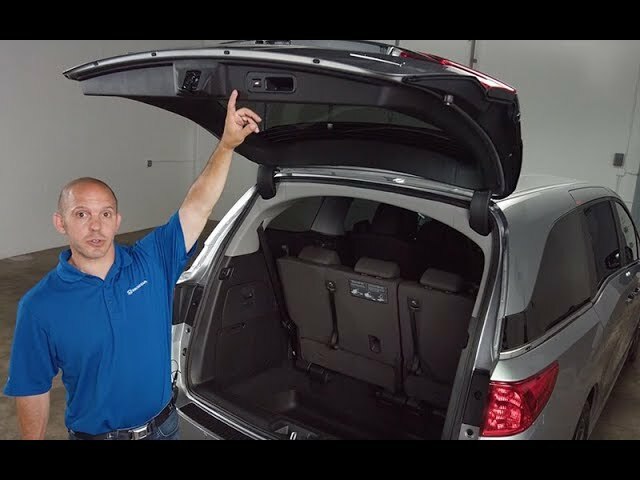 Step behind of the 2017 Honda Pilot as HondaPro Jason shows off the versatility of the trunk. Come alongside of the 2017 Honda Pilot as HondaPro Jason shows you how to get into the second row with just the touch of a button. Join HondaPro Jason inside of the 2017 Honda Pilot as he shows you how to stay up to date with your favorite sports teams. The new 2017 Honda HR-V is now available and HondaPro Jason is here to show it off to you! Join him as he shows off the newly designed front grille, the 17’’ rims, the LED tail lights, the interior features and much more. Check out the links below for helpful tips and tricks from HondaPro Jason. Step inside of the 2017 Honda HR-V as HondaPro Jason shows you a relaxing feature with the automatic brake hold. 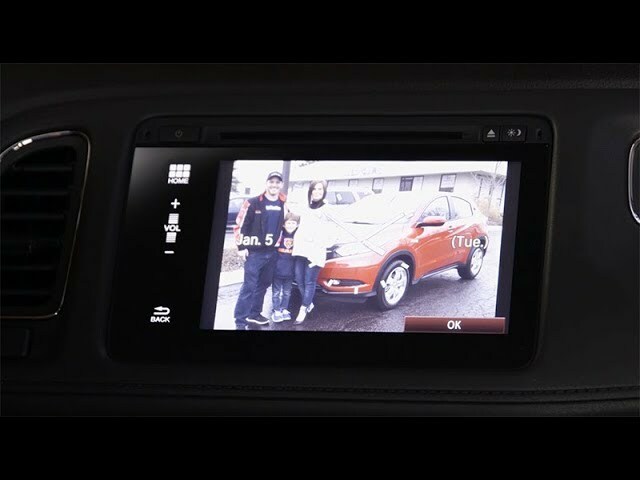 Join HondaPro Jason inside of the 2017 Honda HR-V as he shows you how to customize your display screen with personalized pictures. 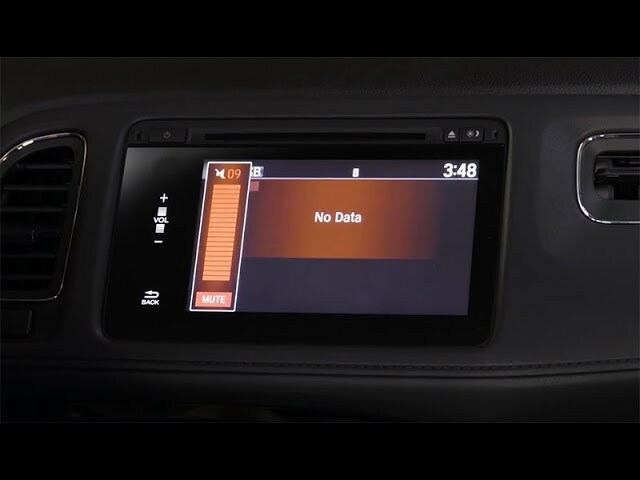 Step inside of the 2017 Honda HR-V as HondaPro Jason shows you the audio display interface that is accessible even while wearing a glove! Step inside of the 2017 Honda HR-V as HondaPro Jason shows off the newly designed electronic parking brake. 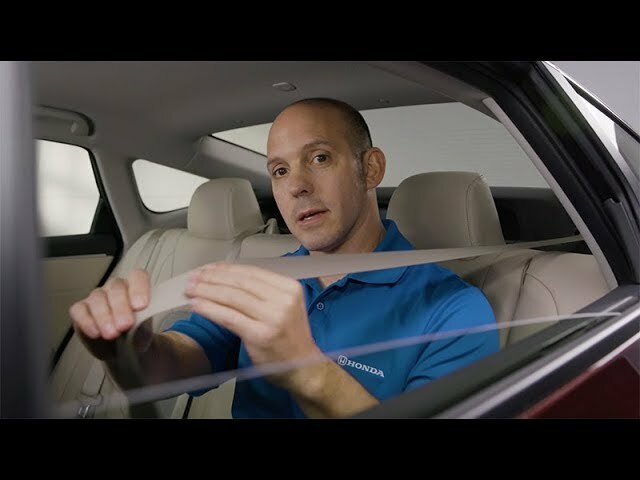 Join HondaPro Jason inside of the 2017 Honda HR-V as he shows off the new auto lock seat belt safety feature. Join HondaPro Jason inside of the 2017 Honda HR-V as he shows you all three modes of the magic seat. The redesigned 2017 Honda CR-V is now available and HondaPro Jason is here to demonstrate its many highlights. Among the changes on this 5th generation SUV are a new active shutter system within the grille for increased fuel economy, chrome accents flowing from the front fascia to the dual exhaust, a capless fuel tank, and LED daytime running headlights. But that's just the beginning! Check out the links below for helpful tips and tricks from HondaPro Jason. Step inside the newly redesigned 2017 Honda CR-V with HondaPro Jason as he demonstrates how to customize the Display Audio touch screen. 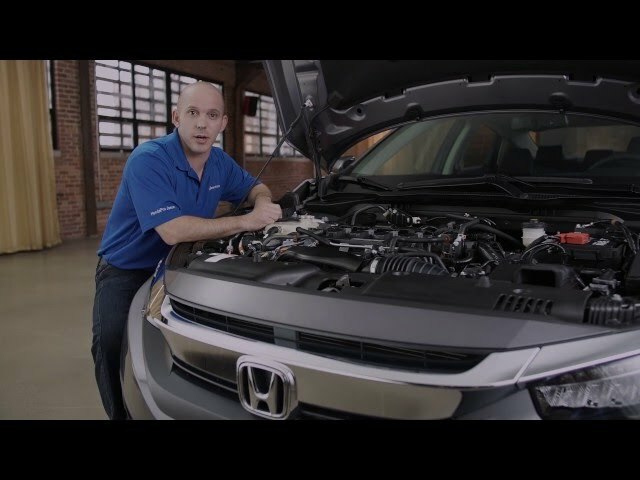 Join HondaPro Jason as he shows you how to turn off the automatic high beam headlight system inside the newly redesigned 2017 Honda CR-V.
Join HondaPro Jason as he shows you around the all-new 2017 Honda CR-V. Learn how to program the height of your power tailgate with the touch of a button. 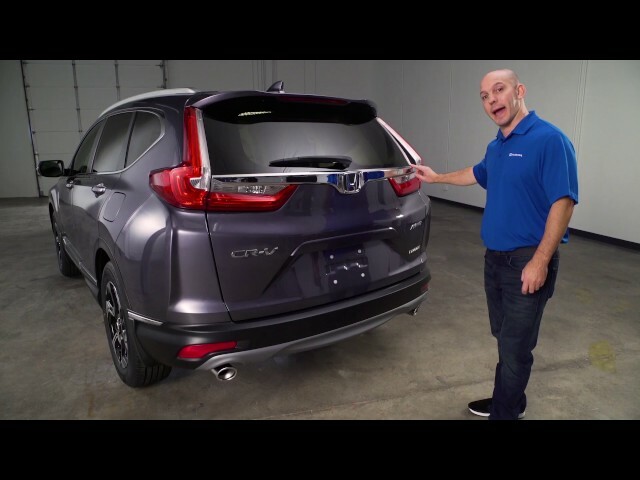 Join HondaPro Jason as he demonstrates how to open up the rear liftgate of the all-new 2017 Honda CR-V without having to use your hands. Step inside the redesigned 2017 Honda CR-V with HondaPro Jason as he demonstrates the new Driver's Attention Monitoring System. Step inside the 2017 Honda CR-V with HondaPro Jason as he shows you how to customize the icons of Apple CarPlay on your Display Audio touch screen. 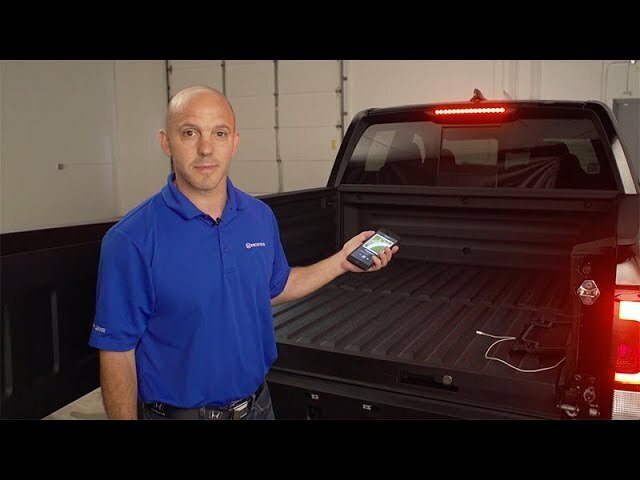 Join HondaPro Jason in the bed of the 2017 Honda Ridgeline as he shows off the new charging compartment. Join HondaPro Jason behind the 2017 Honda Ridgeline as he shows off the new in bed audio system. Step alongside the 2017 Honda Ridgeline as HondaPro Jason shows off the back seat storage, which has enough room to fit a bike! Come alongside the 2017 Honda Ridgeline as HondaPro Jason shows you how to manually override the gas cap. Join HondaPro Jason inside of the 2017 Honda Ridgeline as he shows off the Eco Route feature within Navigation. 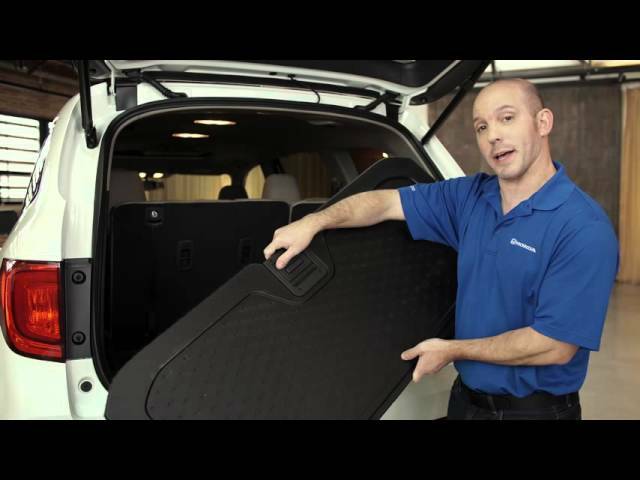 Join HondaPro Jason behind the 2017 Honda Ridgeline as he shows you how to drain the water from your cooler after your tailgate party! 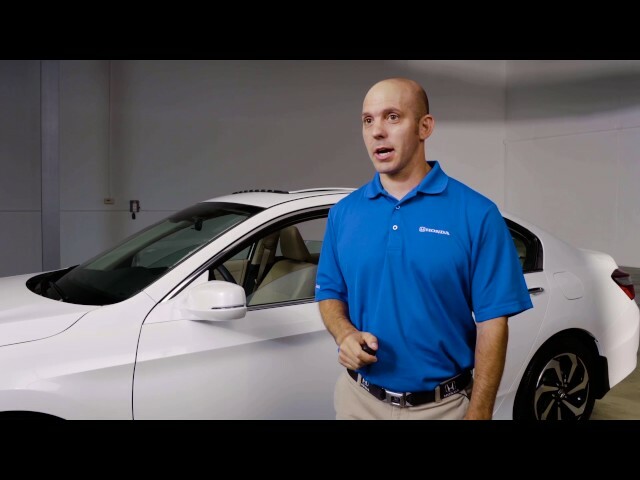 Join HondaPro Jason as he takes you around the 2016 Honda Accord. Check out the inside, outside, and everything in between for the all-new Accord. Want to learn more about the 2016 Honda Accord? Check out the links below for helpful tips and tricks from HondaPro Jason. 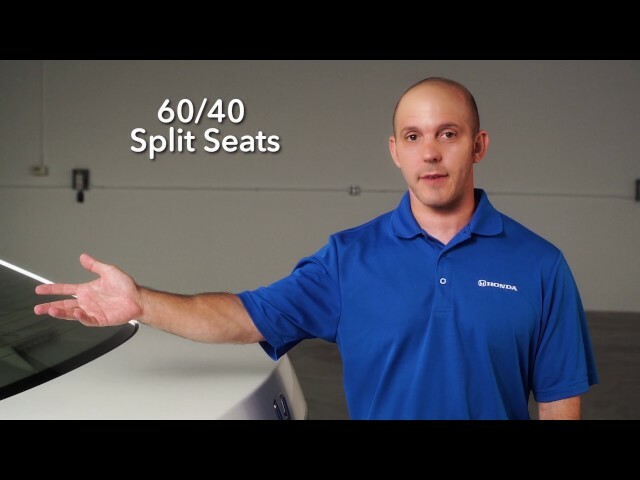 Follow HondaPro Jason as he takes you inside the all-new 2016 Accord and the 60/40 Split Fold-Down Rear Seatback. For added cargo space and/or easy trunk access, you can lay down 60 percent, 40 percent, or 100 percent of the rear seating - all with the pull of a handle! 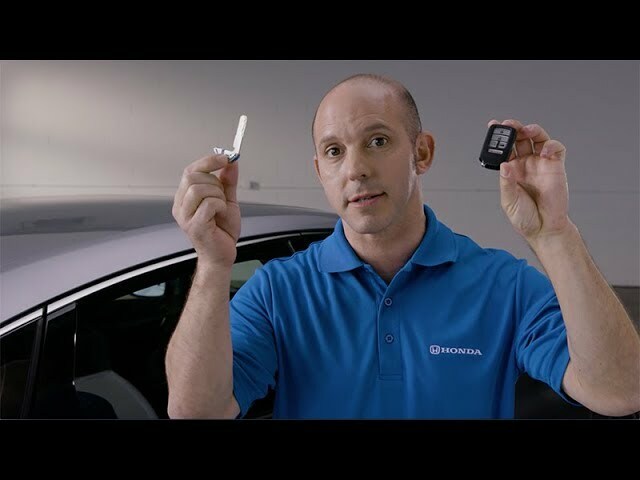 2016 Honda Accord Tips and Tricks: Watch HondaPro Jason as he demonstrates how to use the 2016 Accord smart key. Your key fob can be used to automatically lock and unlock the doors, remotely start the vehicle, open the trunk, put down all of the windows, and sound the panic alarm - all with the touch of a button! 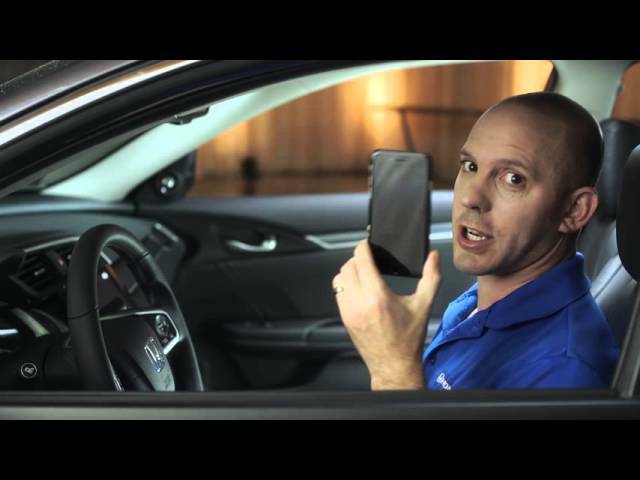 2016 Honda Accord Tips and Tricks: Watch HondaPro Jason as he pairs his smartphone to the all-new 2016 Accord and access Android Auto. Not only does Android Auto allow you to connect with certain apps on your smartphone, it also gives you easy access to your text messages, music, maps, and more! 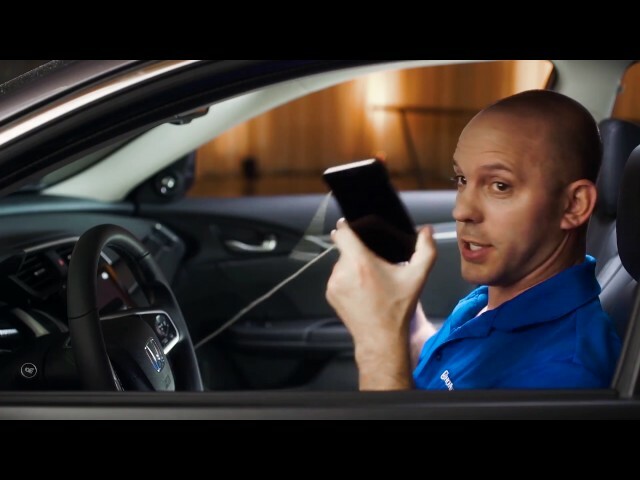 2016 Honda Accord Tips and Tricks: Watch HondaPro Jason as he pairs his iPhone to the all-new 2016 Accord and access Apple CarPlay. Not only does Apple CarPlay allow you to connect with certain apps on your smartphone, it also gives you easy access to your text messages, music, maps, and more! 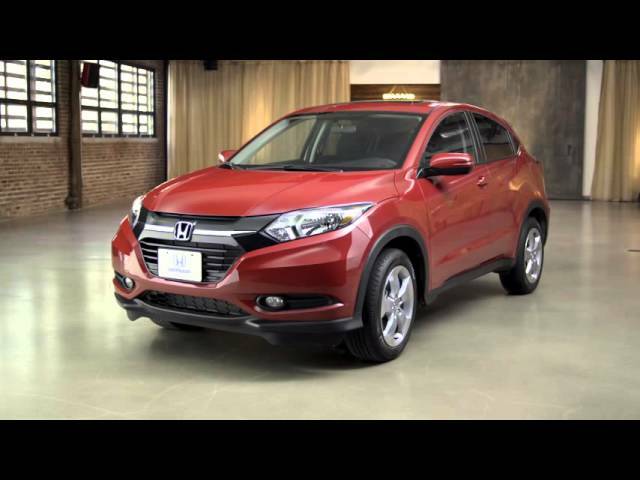 Get to know the all-new 2016 Honda HR-V! Watch as HondaPro Jason takes you on a virtual tour of the 2016 HR-V. Learn about the exterior, interior, and tech features that set the Honda HR-V apart from the competition. Want to learn more about the all-new Honda HR-V? Check out the links below for helpful tips and tricks from HondaPro Jason. 2016 Honda HR-V Tips and Tricks: Are those headlights behind you getting a little too bright while driving at night? Use the 2016 HR-V’s adjustable rearview mirror to block out those blinding, overly-bright headlights. 2016 Honda HR-V Tips and Tricks: On occasion, safety belts have a tendency to become loose, even while fastened. That is why Honda created seat belts with an automatic tensioning system to ensure your child (and adult) passengers are truly safe and secure when you hit the road. 2016 Honda HR-V Tips and Tricks: Gone are the days of a parking brake taking up room in your center console area or on your driver’s side floor. The 2016 HR-V has introduced an electronic parking brake button as a functional, convenient, space-saving alternative to the old fashioned parking brake lever. 2016 Honda HR-V Tips and Tricks: Honda has created a solution for that aggravating stop and go traffic, and it comes in the form of the automatic brake hold. With the touch of a button, your 2016 HR-V will stop (and remain stopped) when the brake pedal is pushed just once. 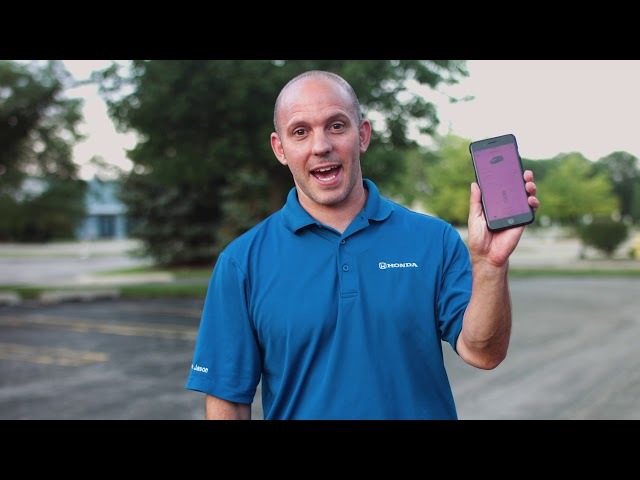 Watch HondaPro Jason as he shows you just how easy and convenient this new feature really is. 2016 Honda HR-V Tips and Tricks: Just like your desktop computer, the 2016 HR-V’s Display Audio screen can be fully customized with any image. 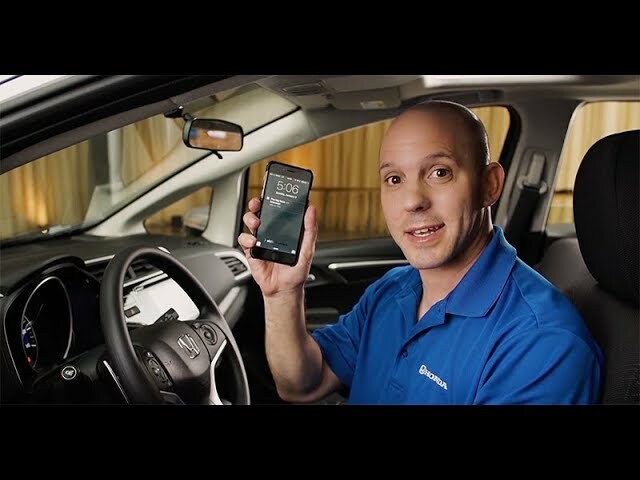 Watch HondaPro Jason demonstrate how to upload a photo to the Display Audio screen via the HR-V’s USB port. Get to know the all-new 2016 Honda Pilot! Watch as HondaPro Jason takes you on a virtual tour of the 2016 Pilot. Learn about the exterior, interior, and tech features that set the Honda Pilot apart from the competition. Want to learn more about the all-new Honda Pilot? Check out the links below for helpful tips and tricks from HondaPro Jason. The all-new 2016 Pilot is loaded with clever, helpful technology, just like the Walk Away Auto Lock feature. Gone are the days of forgetting to put your gas cap back on, or better yet, leaving it behind after you fill up at the pump. Follow HondaPro Jason as he takes a look inside the 2016 Pilot and shows off the interior versatility of this all-new sport utility. Have you ever had trouble getting in and out of someone else’s third row SUV seats? You won’t have that problem with the 2016 Pilot (EX-L and above). Wouldn’t it be nice to automatically receive scores and highlights for your favorite sports teams? Even while you’re listening to music? Don’t you hate missing your favorite song (or not hearing the entire track) on the radio? Fear not! We all know how frustrating a dead battery in your smartphone or tablet can be, especially when you really need to use it. The all-new 2016 Pilot has made this problem a thing of the past, coming well-equipped with three USB ports to charge nearly any electronic device. Watch as HondaPro Jason takes you on a virtual tour of the 2016 Civic. 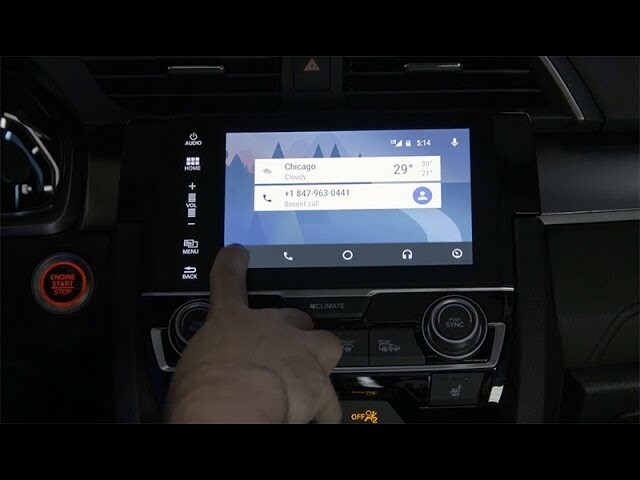 Watch HondaPro Jason as he pairs his smartphone to the all-new 2016 Civic and access Android Auto. Honda LaneWatch is a great safety feature available on the all-new 2016 Civic which allows you to see the right-hand lane on your display screen whenever the right turn signal is used. Would you rather have this feature disabled? 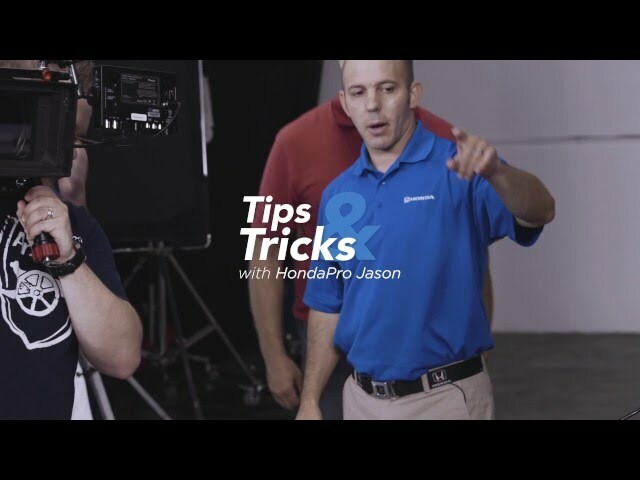 HondaPro Jason will show you how during this quick instructional video. 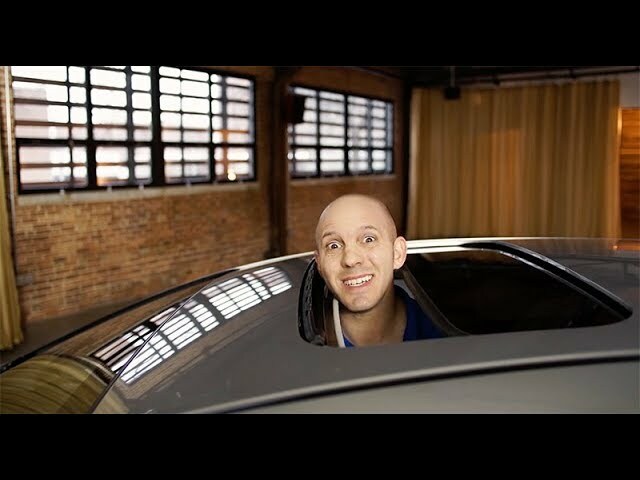 Watch HondaPro Jason as he pairs his iPhone to the all-new 2016 Civic and access Apple CarPlay. 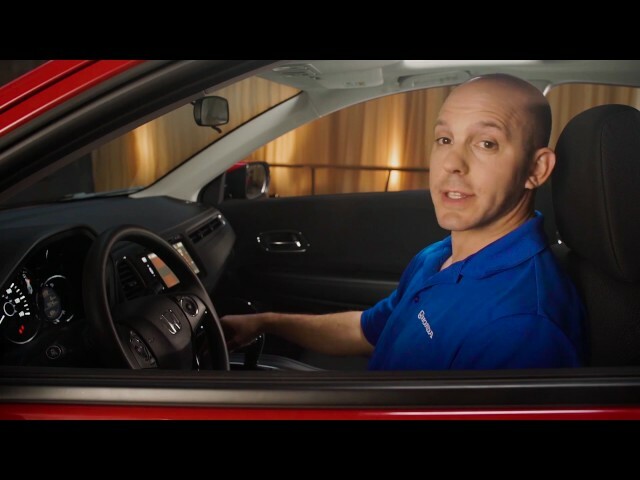 Watch HondaPro Jason as he demonstrates how to use the programmable door locks on the all-new 2016 Civic. 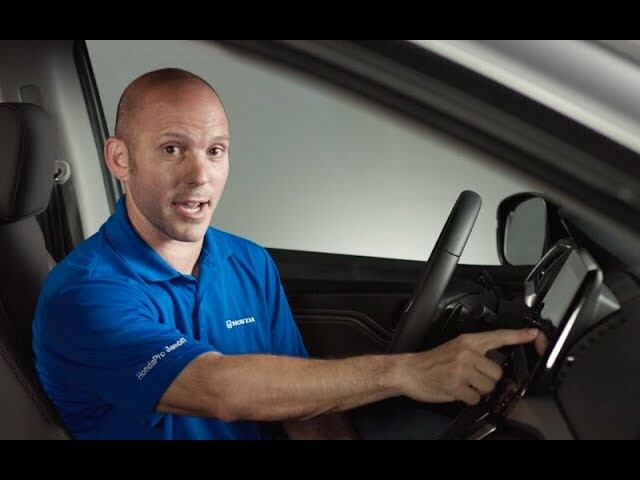 Join HondaPro Jason as he takes you inside the all-new 2016 Civic, more specifically, the functionality of your center console area. Follow HondaPro Jason as he demonstrates how to send an email message via Apple CarPlay or Android Auto without your hands ever leaving the steering wheel. * Based on model year EPA mileage ratings. Use for comparison purposes only. Your actual mileage will vary depending on how you drive and maintain your vehicle.